Minette is Vice-Chairman and President of Kickstart Ventures, Inc., the corporate venture capital subsidiary of Globe Telecom. 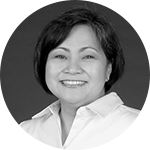 She is a member of the Ayala Corporation’s Innovation Advisory Council, and of Globe’s Innovation Advisory Board. She is a Senior Vice President at Globe Telecom, focusing on New Business, and a member of the Board of Directors of AdSpark, Globe’s wholly owned digital advertising subsidiary. Minette has held a number of CEO/COO positions in various industries, ranging from scrappy Philippine startups to iconic global companies.